This webpage is a collection of Internet resources for different translations of the Book of Psalms into Latin. Many are image files, but some are html/text files. The Old Latin or Vetus Itala versions are translations from the Septuagint predating St. Jerome. A few versions have left many examples, but most are given by only one or two . The Vetus Itala as edited by Pierre Sabatier from citations found in the works of Church Fathers. Published in 1743. Liber Psalmorum, text from Bibliorum sacrorum latinae versiones antiquae seu Vetus Italica. The Roman Psalter or Psalterium Romanum traditionally has been considered St. Jerome's first revision of the Vetus Itala, completed about 384. Psalterium Romanum, text from Weber's critical edition . The Ambrosian Psalter is used in the Ambrosian Rite. The Mozarabic Psalter is used in the Mozarabic Rite. The Gallican Psalter or Psalterium Gallicanum is St. Jerome's revision of the Old Latin made according to the Greek of the Hexapla, some time before 392. The Gutenberg Bible, printed in Mainz in 1454, reproduces the text of a now-lost manuscript of the Exemplar Parisiense tradition, which was the most widely used form of the Vulgate text from the thirteenth century to the middle of the sixteenth century. The Clementine Vulgate is the late medieval form of the text authorized by Pope Clement VIII in 1592. Liber Psalmorum, based on Michael Tweedale's edition at the Clementine Vulgate Project. Weber's critical text , based on the Benedictine version , represents early manuscripts. Liber Psalmorum iuxta Septuaginta emendatus, based on the text at www.musall.de. This is a new translation, with Origen's Hexapla and the other ancient versions in view, and was completed about the end of the fourth century. Liber Psalmorum iuxta Hebraicum translatus, based on the text at www.musall.de. First published at Venice in 1515. A very close and literal translation. First published at Lyon in 1527. First published at Strasburg in 1528. First published in Venice with the Vulgate psalms and commentary in 1530. Published at Basel, as part of a Hebrew/Latin Old Testament, first edition volume 1 in 1534 and volume 2 in 1535, and second edition in 1546. Used by Coverdale in preparing the Great Bible of 1539. Also printed with the 1571, 1574, and 1594 editions of the Latin Book of Common Prayer. Is close to the original, but does not rigidly adhere to the grammatical signification of the words, like Pagninus and Montanus, and so is more intelligible; but by not deviating from the sense of the Hebrew text, retains some of its peculiar idioms. Psalterium, text of the 1546 edition. First published with commentary at Marburg in 1540. Commentarius in psalterium et Psalmorum usus, Marburg, 1540. Also called Versio Tigurina, or Zürich Version. Bibliander completed the last 48 psalms after the death of Juda. First published at Zürich in 1543. Used in the abridged Latin prayer book of Christ Church, Oxford, in 1676, 1689, and 1726 (perhaps 1615 and 1660 as well). Eliminates Hebraisms retained by Münster, but departs in some instances too far from the literal sense. Liber Laudum sive Hymnorum Davidis, text of the 1543 edition. Psalms first published at Basel in 1547; complete Bible with revised Psalms published at Basel in 1551. Style was an elegant Latin like that of the classic authors. Revised for Thomas Parsell's 1706 Latin Book of Common Prayer and Edward Harwood's 1785 revision of Parsell . Psalterium, text of the 1556 edition. First published at Geneva in 1557. Likely based on Juda's version [see the Calvin Translation Society edition of Calvin's commentary on Genesis]. A revision of Pagninus to make it not just more literal than Pagninus, but more grammatically similar to the Hebrew. Used for an interlinear Hebrew/Latin Old Testament in the Antwerp Polyglot, 1572. Complete Old Testament first published at Frankfurt in 4 parts between 1575 and 1579. Said by Calvinists to be strictly conformable to the original text. Was frequently reprinted. Essentially a revision of Tremellius. First published at Herborn in 1611. Gives the closest possible rendering into Latin of every word in the original; but many of the Latin words employed are intelligible only through equivalents supplied in the margin. First published at Lyons in 1650. A very literal translation. First published at Strassburg in 1696. Favored by Emanuel Swedenborg. Translated from a critical edition based on the Masoretic. First published at Paris in 1753. Said to be in high repute for its general fidelity and elegance. First published at Halle in 1787. The Versio Piana, Psalterium Vaticanum, or Novum Psalterium, was published by the Pontifical Biblical Institute in 1945. Its style was more classical than traditionally biblical. Its use in the Office was encouraged but not required. First published in 1969. Translated the Masoretic text while keeping much of the style of the Gallican psalter. Is used in the Nova Vulgata Bibliorum Sacrorum Editio . www.bible-researcher.com/vulgate.html - Articles on the Old Latin and Vulgate by various authors. Eracles - the Medieval translation of William of Tyre's history of the Crusades, with continuations (Old French). Contains (1) the translation of William, from the edition of Paulin Paris; (2) the continuation, from the Recueil des historiens des croisades; and (3) the Chronique du Templier de Tyr, from Les gestes des Chiprois as edited by Gaston Raynaud. Also available at Paul Halsell's excellent Internet Medieval Sourcebook. Shtiler, Shtiler - Mani Leib (Yiddish). Also available at Raphael Finkel's Yiddish and Hebrew Texts page. Di royte beholeh - Morris Rosenfeld (Yiddish). An English language version is available at Rosenfeld's Requiem: The Triangle Fire Victims in Verse. Yidl mitn fidl - Itzik Manger (Yiddish). Song lyrics. Epistolae Tres - Sulpicius Severus (Latin). On the life of Martin of Tours. De sancto Martino episcopo - from the Legenda aurea (Latin). De sancto Patricio - from the Legenda aurea (Latin). The Gawain episode from the First Continuation of Perceval (Old French). For an English version see here. Fender 1946 Pro schematic - the version available elsewhere online has several mistakes. 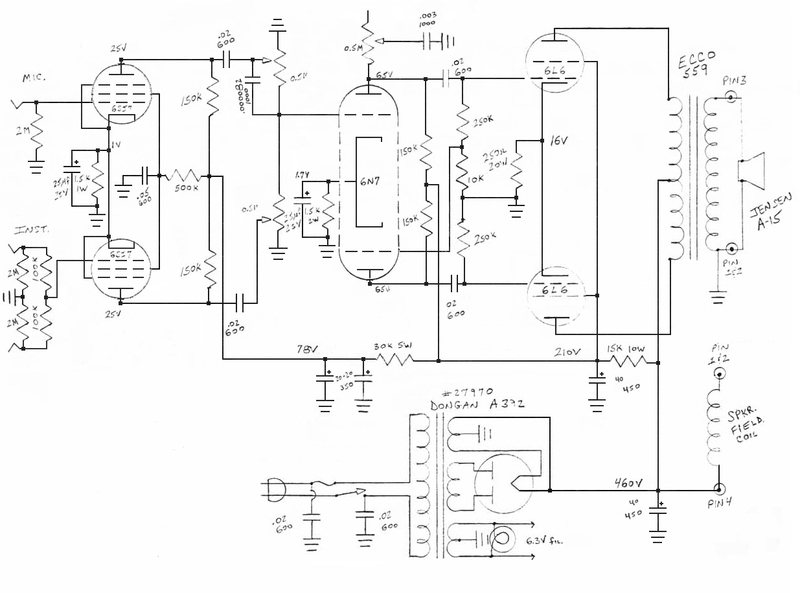 This schematic was corrected from that one, with the advice of Bruce Zinky of Zinky Electronics, designer of Fender's 50th anniversary reissue of the 1946 Pro. Vita sanctae Wenefredae - Prior Robert of Salisbury (Latin). From Acta Sanctorum. For Caefael fans. Kural - Tiruvalluvar (Latin). Translated from the Tamil by Karl Grauel in 1865.